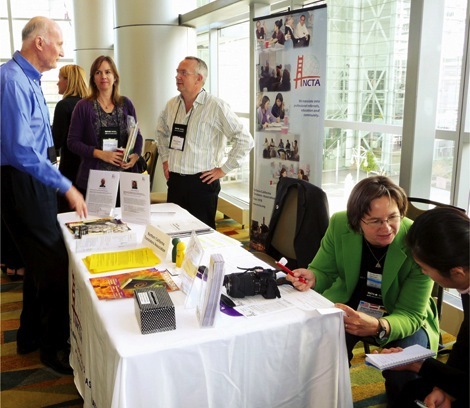 NCTA volunteers kept a lively table at the ATA Conference in Denver. Whatever qualms I had about attending my first ATA conference didn’t last very long. Hopping on the shuttle at the Denver airport, I was greeted by three other ATA members on their way to the conference, and we immediately struck up a conversation. Let the networking begin! Denver was an extraordinary setting for a conference, with its beautiful blue skies and backdrop of snow-capped mountains. I was struck by how new and clean everything was, especially the buses and light rail. The Denver translators association had graciously provided a website with restaurant and sight-seeing suggestions and I was glad that I had time to explore the 16th Street Mall and enjoy lunch at Organixx before my pre-conference session began. There were so many interesting sessions offered that it was hard to choose. I wanted to sample the entire menu – translation tools, talks on potential specialties (in my case, health care and legal), and areas that I knew little about such as audiovisual or patent translation. Where to begin? At the advice of a fellow NCTA member, I started off with “Orientation for First-time Conference Attendees,” which was a wise choice. I came out of that session knowing a lot more about how to get the most out of the conference and consequently totally revised my planned schedule of events, including more marketing and business programs than I had originally planned. I was glad that I had purchased the eConference as there is no way I could attend everything that sounded interesting. Highlights included “Spot the Gallicism” presented by Grant Hamilton and “Leverage Payment Methods to Keep the Most Money in Your Pocket” presented by Eve Bodeux. David Jemielity, the Distinguished Speaker for the French Language Division, presented two superb sessions on French financial translations, probably the best translation presentations I have ever heard. In retrospect, I am amazed at how quickly I met other conference attendees. When I walked into the ballroom for the Welcome Reception on Wednesday evening, I was casting about for someone I knew. By Friday, I was running into people I had met just about everywhere I went. I think that such events as the Welcome Reception, the Division Open Houses, the Division Annual Meetings, and the Speed Networking sessions were great venues for meeting people, as well as for picking up “inside information.” The French Dinner on Friday evening was definitely a highlight for me. By this time I had met a number of people in the division and was feeling more a part of ATA. The Speed Networking Sessions was certainly interesting – as well as test of one’s endurance. The Exhibit Hall was a must-see for information and demonstrations of translation tools, chatting with language service providers, reconnecting with NYU instructors and a surprise meeting with a program manager I had been emailing. I found these personal interactions at the conference to be very useful for creating a visual impression to go along with a name. Barbara Guggemos posted this article under Conferences	on Saturday, January 1st, 2011 at 12:08 pm	You can follow any responses to this entry through the RSS 2.0 feed. Both comments and pings are currently closed. Prev Article ← WHY EDIT? SHOULDN’T IT BE PERFECT?